Holy Spirit, I humbly request that the fruits You have planted within me, Your faithful servant, grow and blossom into a revival. 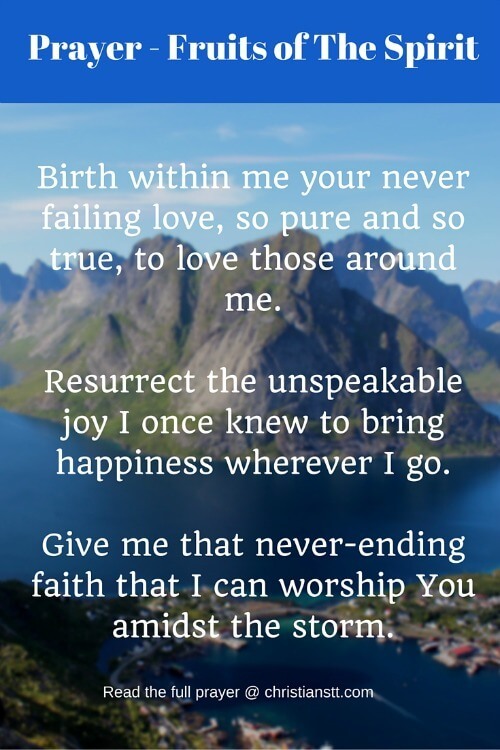 Birth within me your never-failing love, so pure and so true, to love those around me. Resurrect the unspeakable joy I once knew, to bring happiness wherever I go. Implant peace within my heart, as my mind stirs constantly. Give me that never-ending faith that I can worship You amidst the storm. Allow me to be meek when unbearable situations arise. Grant me the temperance I need to display Christ in all that I do. Galatians 5:22, 23 But the fruit of the Spirit is love, joy, peace, patience, kindness, goodness, faithfulness, gentleness, and self-control. Against such things there is no law. Galatians 5:19-21 Now the deeds of the flesh are obvious, which are: adultery, sexual immorality, uncleanness, lustfulness, idolatry, sorcery, hatred, strife, jealousies, outbursts of anger, rivalries, divisions, heresies, envy, murders, drunkenness, orgies, and things like these; of which I forewarn you, even as I also forewarned you, that those who practice such things will not inherit God’s Kingdom. Oh Lord, my God, allow me to display these attributes, so that Your people would see You within me and want to know You more. The more they seek You, they will definitely find You. Lead me, Oh Lord, in a plain path. Cover me under Your precious blood, so that Your fruits would allow me to withstand the works of the devil. In Jesus’ Mighty Name I pray, Amen! James 3:18 Now, the fruit of righteousness is sown in peace by those who make peace. Ephesians 5:8-9 For you were once darkness, but are now light in the Lord. Walk as children of light, for the fruit of the Spirit is in all goodness and righteousness and truth..